The Slider component creates an interactive slider. You can toggle between horizontal and vertical orientations. You configure the component by specifying the range, default value and the tooltip. You can adjust the size of the slider by dragging one of the end-point handles. Increment The amount by which the slider value increments. This allows you to create “ticks” along the slider. Min Value Minimum slider value. Max Value Maximum slider value. Show Tooltip Show or hide the tooltip. The tooltip is displayed while dragging the thumb of the slider. 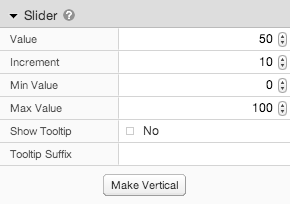 Tooltip Suffix Suffix added to numerical slider value.